Early history examines the archaeological record that tells the story of the first inhabitants of Alabama. Learn about the prehistory and culture of the first early inhabitants, and what lessons it might teach us about the early history of Alabama. 10,000 BC - 7000 BC - The first inhabitants of the area we now call Alabama were of the Paleo-Indian culture, semi-nomadic hunter-gatherers who lived in caves or in the open countryside around 10,000 years ago. (e.g. Russell Cave in Jackson County and the Stanfield-Worley bluff shelter in Colbert County). The Paleoindian stage is characterized by small, nomadic bands who gathered plants and hunted Pleistocene megafauna with large fluted projectile points such as Clovis, Cumberland, and Dalton. 7000 BC - 1000 BC - The Archaic stage is characterized by larger groups of people coming together in seasonal camps who hunted smaller game such as deer, rabbit, turtle, frog, etc. A greater emphasis was placed on gathering nuts and vegetables than in the Paleoindian stage. More diverse artifacts have been found in Archaic deposits such as groundstone tools, large, stemmed points, and stone vessels, to name a few. 2500 BC - 100 BC - Gulf Formational Period of Indian culture with increasing sophistication in ceramic development with tempered pottery. 300 BC - 1000 AD - The Woodland Stage is characterized by its developments in pottery, the introduction of the bow and arrow, conical burial mounds, long-distance trade items, and agriculture. Also during the Woodland Stage is an increase in ceremonialism, perhaps as a result of people settling down longer in towns and villages. Woodland Indians appear to have placed greater emphasis on tending crops, such as maize, than their Archaic ancestors. Alabama- The Native word is "Albina" which means to camp....This tribe belonged to the Muskhogean Tribe which was the Southern Division. Atasi- A sub-tribe of the Muskgoee. Apalachee- This is one of the older lower creek tribes of Alabama. A few later joined the Creeks to he move to Oklahoma. Apalachicola- The early tribe lived on the Chattahoochee River & then moved to the other side to Georgia. Cherokee- Occupied towns such as Turkeytown which runs by the Coosa River in my hometown to towns such as Muscle Shoals, Wills Creek in Willstown, & Tuscumbia & where just about wiped out & removed by 1835. Chatot- A tribe near Mobile. Choctaw- A tribe that shortly occupied the Tombigbee area for hunting grounds. Chickasaw- A tribe that covered the Nortwest part of Alabama. Creek Confederacy- This tribe was built around the Muskogee which where dominant at the time. They also occupied the Coosa River in my hometown at one time. Fus-hatchee- Another branch of the Muskogee tribe. Eufaula- Also, a subtribe of the Muskogee. Hitchiti- A Muskhogean tribe which branched into Georgia. Hilibi- Another subtribe of the Muskogee. Kan-hatki, Kealedji, Kolomi, Koasati, Muskogee, Okchai, Pakana, Wakokai, Wiwohka, where all subtribes branched from the Muskogee tribe which was apparently the most dominant tribe of Alabama. The Tukabahchee tribe was one of the four heads of the Muskogee's. Mobile- This was a subtribe of the Choctaw &/or Chickasaw. Muklasa- Also, a branch of the Choctaw. The word means "friends"
Napochi- The nearest connection found was to the Choctaw. They stayed around the Black Warrior River. Natchez- This tribe stayed near the Coosa River as well & later joined the Creeks to Oklahoma. Okmulgee- This was a branch of the Creek tribe. Osochi- It is believed their language was Muskogee but little is known about the meaning of Osochi. The closest relation seems to be with the Chiaha. Pawotki- This tribe came from Florida & later joined the Creek Confederacy. Pilthlako- Also, a branch of the Creeks. Sawokli- This tribe belonged to the Muskhogean tribe. Shawnee- They occupied the Tallapoosa & Sylacauga areas. Taensa- This group came from Louisiana & settled in Mobile. Tohome- This was a division of the Muskogean tribe. Tuskegee- Also, a branch of the Muskogeans. Yuchi- This was an older tribe from around the Muscle Shoals area & it is suggested they probably moved toward the East Tennessee area. Yamasee- This tribe was in the Mobile Bay area & later moved to West Florida area with the Seminoles. Alabama was populated by many Native American groups when Europeans arrived in the 1500s. These Native Americans were mostly unaffected until the French established a permanent settlement in 1699. Groups of native people can be identified as belonging to one of the historic tribes of Alabama, including the groups who speak Muskogee, and those belonging to the Mississippian chiefdoms. These groups combined to become the Creek Confederacy. In similar fashion, other groups of tribes came together to create the Choctaw, Chickasaw and Cherokee tribes. Agriculture was practiced by Indians such as the Creeks and Cherokee in the east, and the Choctaws and Chickasaws in the west when Spanish explorers arrived. The first known European contact with what would become Alabama occurred in 1519 when Alonso Alvarez de Pineda sailed in Mobile Bay. Cabeza de Vaca (and possibly PÃ¡nfilo de Narvaez) visited Alabama in 1528, and the Spanish did not really explore the area for another two decades, when Hernando de Soto led an expedition into the region about 1540. In the 1700s many more Europeans moved into the area. Eventually these new residents would clash with various Native American groups, many of whom were organized as the Creek Confederacy. The first permanent European settlement in Alabama was founded by the French at Fort Louis de la Mobile in 1702. The British gained control of the area in 1763 by the Treaty of Paris, but had to cede almost all the Alabama region to the US and Spain after the American Revolution. Between 1805 and 1806, the Choctaw tribes (in western Alabama) and the Chickasaw and Cherokee tribes (in northern Alabama) were forced to cede their land to white settlement. 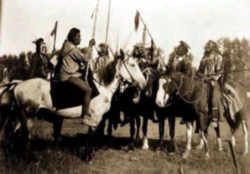 The Creek Indians attempted to ally themselves with other tribes from the North in resistance to white settlement, but were ultimately unsuccessful. As a result, most of the native people of Alabama were resettled in the Oklahoma territory.